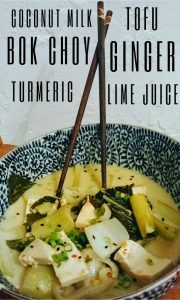 What better way to use your bok choy than in a delicious Thai inspired coconut milk soup. I made my own alterations from a recipe that I found online from ArtfulAppetite.Com. I added some sliced spring onions, garlic, and pan seared tofu. It was a last minute decision to try and use up my wilting bok choy and onions so I didn’t have time to run to the store to get some of the special items such as bean sprouts, thai pepper, cilantro and mung bean vermicelli which I am sure are all very delicious in this recipe. My recipe alterations are in the parenthesis. Cut off the root ends of the bok choy, wash to remove the sand, chop the leaves and set them aside. In a large pan, heat the coconut oil over medium-high heat and add the ginger, garlic, lemon zest, lime zest, turmeric and red Thai pepper. Cook for 2 minutes, add the lime juice and chopped bok choy, and cook for another 2 minutes. Add the water, coconut milk and salt and let it simmer for 5 minutes. Separately, pan sear the sliced tofu with some olive oil, two cloves of minced garlic and sliced onion for about 5 minutes or when the tofu has browned edges. Toss the tofu, onions and garlic into the coconut and bok choy mixture. Season the soup with more salt and red pepper to taste. Directions for cooking Vermicelli: In a separate bowl, pour boiling water over the vermicelli and let it sit for 5 minutes or until the noodles are cooked. Drain the water from the noodles. Divide the noodles between 2 or 4 bowls and pour the coconut bok choy soup over the noodles. Garnish with bean sprouts, fresh cilantro, and sliced red Thai pepper. Serve immediately.